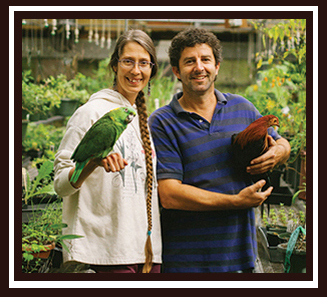 Contact Information, Maggies Herb Plant Nursery, Mailing Address, e-mail address.Phone Number, Driving Directions. near the St. Johns River and Lane Landing/Tocol Creek /Picolata. 10 am to 4 pm - 6 days a week, closed Mondays.We are closed on the following Holidays: New Year's Day, Memorial Day, Independence Day, Labor Day, Thanksgiving Day, Christmas Day.We might be closed due to an unexpected emergency, so to avoid disappointment, please telephone office phone to get recorded message for any update 904-829-0722 before leaving on your journey.Thank you. 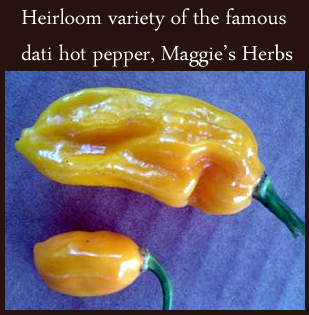 Heirloom variety of the famous datil hot pepper now available at Maggies Herb Farm !!
. If you would like, we can give you easier-to-understand driving directions.or click ( HERE ) to see driving directions.